If you would prefer to leave a testimonial directly with us, we will post it below on on this page for others to see. Further to my previous email. I called Jacksons Ford in Teddington after writing the email below, and spoke to a chap called Warren. He was extremely helpful, explained that in most instances on new vehicles this was due to the factory not resetting the oil-change diagnostic system correctly before releasing the vehicle and that he’d experienced this on a few other vehicles recently. He said it was very unlikely an oil change was needed, but he would happily take a quick look at the car as soon as I could get there. I drove to Teddington (about ten minutes away), and within five minutes they had checked the car, reset the diagnostics and told me to give them a call if the error came back, otherwise the service would be due in September. The receptionist was charming, and the whole process quick, friendly and efficient. No charge. What a difference. I will certainly be using Jackson Ford for future servicing – 5/5. Not only did Chris Jackson, save my old car (the insurance company wrote it off and it only needed a new door), but he has now found me the exact car I need for two grandchildren. He is always helpful and I have complete trust in all my dealings with his garage. Chris Jackson is a Ford man through and through and when he came upon our antiquated Ford Scorpios (one a Cosworth!) he was in his element. He has tackled head on the problems with keeping these old cars afloat, while I am sure many other garages would have nodded their heads and consigned them to the scrapheap. Chris’s irrepressible good humour masks an incredible sharp mechanical knowledge of all things cars. I arrived at Jacksons really concerned about my car, they were so lovely (I got a bit teary!) - helpful, reassuring and did everything they could to help. Including calling to make sure I was ok! Having completed the work very promptly and priced very reasonably, I am a VERY happy customer. I thought I was in a dream the service was so good I couldn't have been treated better by Chris (Jackson) and his wife Vicky. It was like being part of a wonderful family. If the experience of going to buy a secondhand car is sometimes thought of like going to the dentist for a root canal filling, going to "Jacksons" is like going on your favourite holiday with your favourite people. Wonderful customer service, efficient, fast and comprehensive, always with a smile and good humour. I suspect other family members will be heading your way soon, so overall we are v pleased and have recommended you already! Thanks once again all the team at Teddington. To any ladies out there like me- nervous of anything to do with cars -this team are exceptional and you and your car (whatever make-not just Ford) will be treated with care and respect- no matter how little we may know about cars, or how badly we may park/pull away at the service due to being nervous at having to do an MOT/Service etc. (these last comments of course not inclusive of confident lady drivers). You will be fully informed of any action the team propose to make on your car, and just ask whatever you want to- no question is ever seen as silly and they patiently answer all. Drives so much better after each service and spotless- thank-you. Ladies and Gentlemen- Just go here. It is just a great service -more so you can then have full confidence in your car after this. Never one to readily complete appraisals such as this, I am nevertheless inspired to do so when encountering good, old-fashioned service such as I have just received at Jacksons. It may well be that a contributory factor is the fact that this is a small, tightly-controlled family-run operation but, having been dealt with by 3 members of staff, I suspect that there is a strong policy to urge employees to be as friendly and as helpful as possible to customers. And it works. A real find. More power to their elbow. Excellent service from the guys in Teddington straight from the off!! I had some sort of electrical problem on my focus that would have driven most people crazy but within a few days and god only knows how many attempts at trying every possible option they had it sorted and the car was back up and running! Chris & Warren kept me informed on a regular bases and in my opinion went above and beyond what was expected! Brilliant Customer service. Took the car there for burning smell. They diagnosed the problem and kept me up to date with progress. They did a proactive visual health check and gave me recommendations, but were not pushy at all. Warren was really assuring when he was talking about the issues. Not greedy or trying to rip off you (which I sensed with some other Motor Garages). The reviews below really say it all! I was fortunate enough to meet Chris recently when looking to purchase a reliable car for my family. Chris took my brief and in a matter of days had found the perfect vehicle. When I picked it up I couldn't believe it wasn't brand new! It looked amazing. On top of this the friendly and attentive service we received from Chris and his team who also lent us a car for a short mini break while they were getting our car ready was really outstanding. I can not recommend Jacksons enough and am totally delighted to have found them. November 2016. Always had good service from Jackson's and feel confident with their workmanship. I have used Jacksons for the past four years and everytime they provide a professional service from the time you leave your car until the time you collect the vehicle. I would not consider taking my car elsewhere and nor should you. My grateful thanks to Jacksons who do a fantastic job keeping my old Mondeo (470,000 miles on the clock, target half a million) on the road. Everybody at Jacksons is friendly, obliging and helpful, as well as being highly skilled and professional, taking their lead from Chris. For me it is an absolute pleasure doing business with this garage. Highly recommended. MARCH 2016. I viewed a 2001 Lexus LS430 at Jackson Motors last week. Most LS430's of this age have been abused, even though they are advertised as being "Loveley", Excellent, etc. As a result I am very suspicious of every one I see. Chris Jackson told me about the car not having been used for over 2 years and that it was in perfect condition. As a result of me being an OCD geek I was able to point out three quite obscure things that were wrong with the car. None of them was particularly major, but one would have cost a lot to rectify at a Lexus dealer. Chris didn't argue - He simply offered to do the work before I accepted the car. I put down a deposit that was to be returned in full if they hadn't sorted the problems within 3 weeks. 3 days later the car was ready! I've just driven it home and it's clear that the car really is now just about perfect. Happened to se this car on the forecourt as I was walking by & when I showed an interest found myself on a test drive in 2 minutes flat! Car drove beautifully so after leaving a depost I arranged to collect it a couple of days later. The car was serviced & valeted, the paperwork was done quickly (inc road tax) & all properly explained & off I drove in my new car! It was a pleasure to do business with Jacksons. I bought a 2008 Ford Fiesta from them at a very reasonable price of £2295. 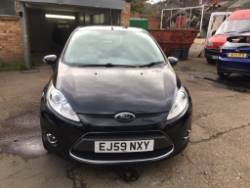 The price included MOT and full service, as well as Ford BlueService breakdown cover for a year. I found all of Jacksons' staff very helpful. They assisted me with the paperwork, helped me dispose of my old car which was due for retirement, and were very prompt to resolve minor issues I had with the stereo, driver's seat and missing lifting jack which I discovered after getting the car home and driving it. Cannot fault them for fast efficient service, I've moved house but won't move from Jacksons, even though it's epic at times getting through the traffic.